Contrary to popular belief, Poinsettias are NOT poisonous and research indicates they are not harmful to people or animals. However, it is advised they NOT be eaten. Avoid exposing plants to extreme cold. Your vehicle should be warm for transporting. Place your plants in a room with sufficient natural light to read fine print but not direct light. 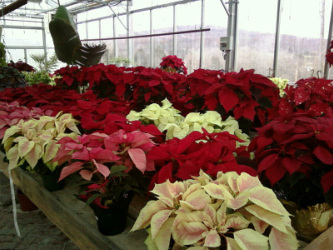 Poinsettias will droop and may develop yellow leaves if the light is too low. In the home, avoid drafts or excess heat from woodstoves, fireplaces, appliances, radiators, or ventilating ducts. To prolong color and longevitiy, room temperature should not exceed a day time temperature of 74° and not below 62° at night. If you have questions about your poinsettia, please call us!